Pictured is Tammy DeLong, administrative director of the Highland County Homeless Shelter, and well representatives of KFC. Colonel Harland Sanders’ secret to a well-lived life included giving back to the community and helping community causes. 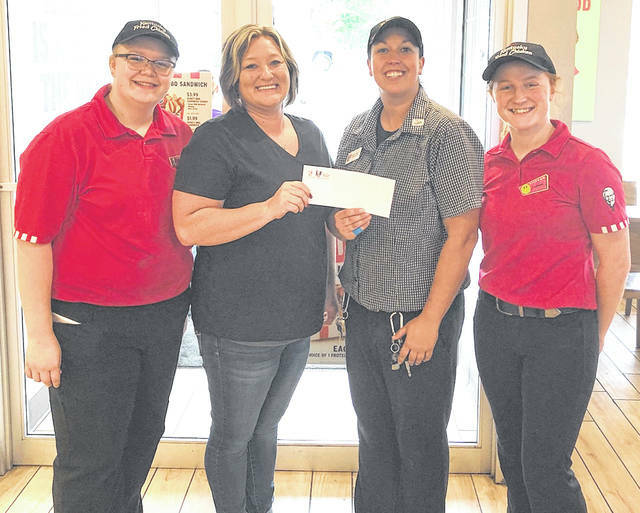 Kentucky Fried Chicken in Hillsboro and the Highland County Homeless Shelter recently teamed up to hold a Community Fundraising Night on Sept. 12 to help raise monies for the shelter. Guests were given flyers to bring in and give to the cashier, which in turn allowed KFC to donate $400 of the evening’s proceeds to the shelter. The monies will be assist in the daily operations of the shelter. The Highland County Homeless Shelter is a 501C3 non-profit organization with no government funding. The operation of the shelter relies on donations and fundraising. The Highland County Homeless Shelter is open 365 days a year. The shelter can offer assistance and support for up to 28 men, women and children, for a maximum of 90 days. They provide beds, food and shelter, along with access to essential programs and services that enable homeless individuals to rebuild their confidence, and their lives. Donations may be dropped off between the hours of 8 a.m. and 4 p.m. Monday through Friday. Submitted by Krystal Weddington, Bagshaw Enterprises. https://www.timesgazette.com/wp-content/uploads/sites/33/2018/10/web1_KFC.jpgPictured is Tammy DeLong, administrative director of the Highland County Homeless Shelter, and well representatives of KFC.